The Dr. Robert E. Beamish Award is presented to the first author of an original research article published during the preceding three years in The Canadian Journal of Cardiology and judged to have the greatest (potential) impact on cardiovascular medicine. 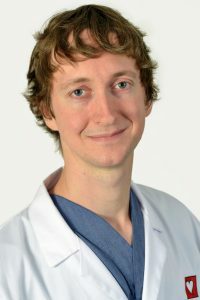 Dr. Jason Andrade is a Cardiac Electrophysiologist at Vancouver General Hospital (VGH), with a joint appointment at St. Paul’s Hospital and the Montreal Heart Institute. He is also an Associate Professor of Medicine at the University of British Columbia, and Adjunct Professor at the Université de Montréal. At VGH, Dr. Andrade is director of the Electrophysiology Program. He serves as medical lead for Provincial Atrial Fibrillation Care, and is co-chair of the CCS Atrial Fibrillation Guidelines. Previously, Dr. Andrade was education chair for the Canadian Heart Rhythm Society. Join us in congratulating Dr. Andrade on this wonderful achievement.